A month after Huawei being in the news for allegedly enhancing the performance of its devices to receive attractive benchmark scores, Oppo has now been caught in "artificially" producing "high and misleading" benchmark scores. UL Benchmarks, the makers of benchmarking app 3DMark, has delisted the Oppo Find X and F7 for unfairly boosting benchmark results. 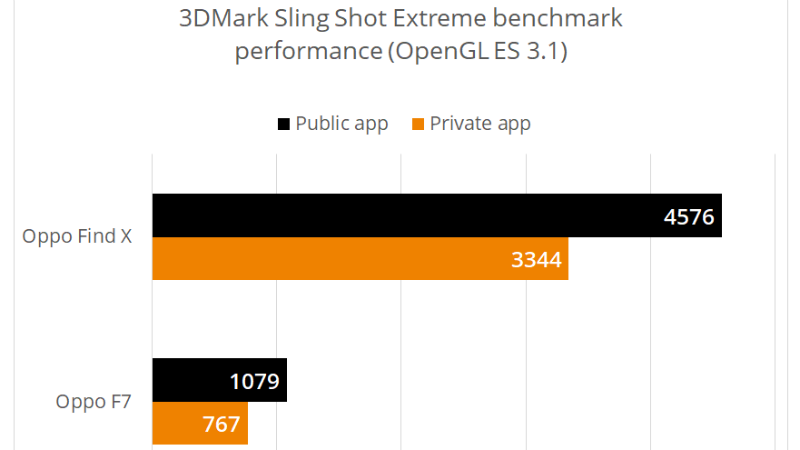 The company analysed the both affected models tweak the performance to receive up to 41 percent higher scores on the public 3DMark app than the scores from the private app that isn't available to end users and manufacturers. Oppo, in a separate statement, acknowledged the ability of its devices to detect benchmark apps to adjust their performance. UL Benchmarks, on request of technology site Tech2, examined the performance of the Oppo Find X and later tested the F7. The company was able to confirm the flaw in both devices by using a private version of its 3DMark app and detected as much as 41 percent higher results on the public 3DMark app that is available to end users and manufacturers over what was received on the private version. "The difference in scores tells us that the devices are simply recognising the 3DMark app by name rather than adapting to the type of work in the test. This kind of detection and optimisation is forbidden by our rules for manufacturers," the company said in its detailed post. Oppo admitted that that the Find X and F7 were detecting the public version of the 3DMark app, as mentioned by UL Benchmarks, and commented, "When we detect that the user is running applications like games or 3D Benchmarks that require high performance, we allow the SoC to run at full speed for the smoothest experience." The Chinese vendor also elaborates that for unknown apps, such as the private 3DMark app in the current case, the system adopts the default power optimisation strategy and after the user hasn't actively operated the handset for five to 10 sections, the hardware limits the system performance to 70 to 80 percent. Having said that, Oppo has suggested improvements to its existing approach to uplift the experience. "[W]e are working on upgrading the system, and strive to distinguish between the requirements of undetected apps or the subjective needs of users," the company said in its statement to UL Benchmarks. It looks like Oppo is following in the footsteps of Huawei that was caught in a similar benchmark scandal last month and faced delisting of the Huawei P20, P20 Pro, Nova 3, and Honor Play for allegedly producing artificial benchmark results. The company reacted to the allegation and announced open access to the 'Performance Mode' in its EMUI 9.0 to let users decide when they need to maximise the performance of their devices.